More talk this morning about robots replacing humans, this time in the manufacturing sector. 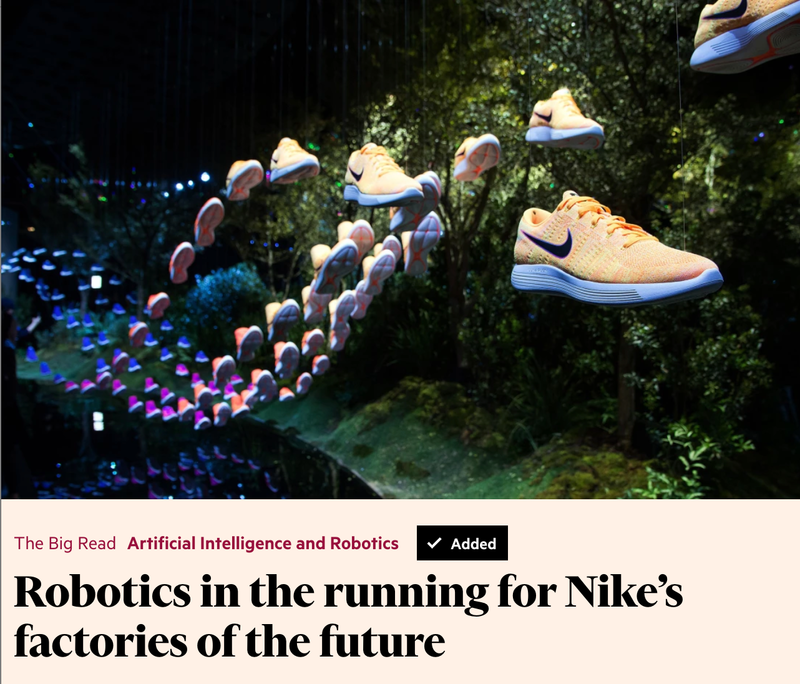 Monday’s Financial Times talks about a long-term project from Nike to replace human workers with robots in a partnership with Flex. When I read this news, I had Deutsche Bank CEO John Cryan’s words ringing in my ears “those workers behaving like robots will be replaced by robots”. In many ways high-end shoe manufacturing is the perfect target for robots, and it will also allow Nike to deliver new designs faster, and perhaps custom make shoes to designs and custom colour specifications from consumers via an app. Have you developed a plan in your organisation to take advantage of robots or AI for boring/repetitive tasks? If not, why not? They seem to be just around the corner in many industries.